Thank you in advance for your contribution to this cause that means so much to all of us. Help us KEEP THE RIDE ALIVE so we can eradicate Polio once and for all! *it will help ensure El Tour de Tucson will continue. All donations are IRS qualified charitable contributions. All contributions will go toward District 5500's goal of being Title Sponsor of El Tour de Tucson 2019. If our goal is not reached, all contributions will be donated to Polio Plus or refunded at the contributor's request. Monies in excess will carry over for the Title Sponsor position in 2020. Currently, we have $1,000 donors...get your riding team together and pool your monies. Don't have a team? You have 6 months to organize one! El Tour de Tucson is an annual bicycling event for all ages and abilities held in November in Tucson, AZ for the past 36 years. It costs $1.3-1.5M for Perimeter Bicycling Association of America [PBAA], a non-profit organization, to put on El Tour de Tucson each year. And, every year the expenses to put on the Ride have increased. PBAA raises the funds to put on the Ride mostly through sponsorships and rider registrations. Very little money is received from the City or County--in spite of the estimated $16M of economic impact on the local community. The impact for Rotary has been over $53 M in funds raised for Rotary's Global Polio Eradication Initiative over the past 9 years. If the Ride doesn't go on, Rotary will lose the largest fundraising event it has ever seen. 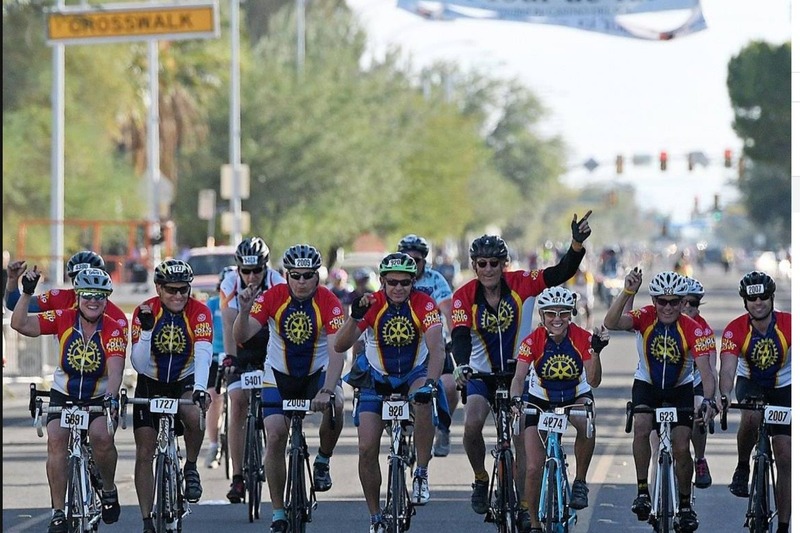 Rotary District 5500, Southern Arizona, is committed to Keeping the Ride Alive. To ensure the Ride will go on, District 5500 has decided to raise funds to be Title Sponsor of El Tour de Tucson. Please visit us at http://ridetoendpolio.org for more information. We raised $53M in the last 9 years to eradicate polio! District 5500 wants and needs your support! Please donate today! The donations are beginning to come in. Please share with your family and friends, all donations are greatly appreciated. Let's make Rotary District 5500 Title Sponsorship of El Tour de Tucson..Ride to End Polio!